An Inquisitor is required to keep track of immense amounts of facts and data. It is therefore common that they use logic-engine equipped servo-skulls for such tasks. The DLC is available on Steam and the Neocore Store for $1.99, but you can also spend 800 Fate to obtain it from the in-game store. 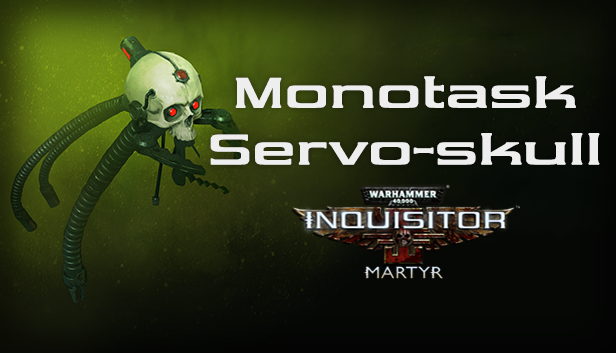 Additionally, the Steam Autumn Sale has started, with a discount of 25% on Warhammer 40,000: Inquisitor - Martyr, so make sure you grab it if you don't own the game already. The sale lasts until November 27. Just wondering though. Been thinking about this for a while. And why shouldn´t it be possible when thinking about it, at a later date perhaps. Why not make perhaps some of the Pets that are being/going to be made into upgradeable and Levels as well? Like new Skills, equippable Weapons, better gadgets, etc, etc..
At least some things for you Developers to maybe think about. Can´t see the reason why it shouldn´t be. Will it available to console player later? And as we should stay on topic here, it is nice with some new Pets from time to time here too. We really should't get into the "console-vs-PC... discussion" (!!!) - that never ends well... because it actually "never ends"! Everyone who has played "The Witcher 3" on PC with all settings to maximum and then fires up Witcher 3 on PS4 to compare them screen-to-screen... that person KNOWS the difference and why framerate IS important! And yes, I did the same with Inquisitor: Martyr... because I bought it on PC and PS4...! Don't judge me! Well guess what: once more the console (PS4) version is locked at 30 FPS! To some that doesn't matter (...they say) but considering what Inquisitor: Martyr plays/feels/controls like on my GTX 1080-powered PC... well, it's day-and-night of a difference! When you look at god of war (2018), it runs great on a €249.90 PS4, not sure you can have same thing on a PC !! Ps4player here.we have a ingame store? Again thank you for this Neocore really enjoy new pets!